Kiss & Tell, a monthly party at Rose Live Music in Williamsburg, Brooklyn, has been producing unique theme based events since 2007. Kiss & Tell DJs play italo, disco (classics and edits), party jams, electro, house, girl groups, gothypants, new wave, and post punk. Oh no, shipwrecked! Our ship has capsized and there is no hope of getting rescued. Thankfully, the desert island we are stranded on has an amazing salvaged record collection and endless bottles of rum. Time for a beach party! 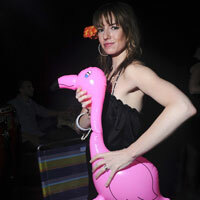 Let's start the night with a romantic happy hour set of exotica, lounge, seaside shanties, and luau music. Once we get buzzed, DJs Duckcomb and Shakewell from Sharegroove will play their rarest disco gems and exclusive edits. 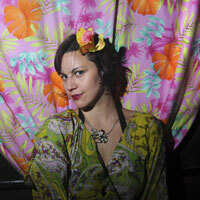 Our lovely resident siren Bethany Benzur is sure to sink some ships with her sultry selections. Dress to impress: Drowned Disco Dollies, Battered Beach Bunnies, Mangled Mermaids, Haunted Hula Girls, Dead Lifeguards, Prickly Pirates, Tropical Tramps, and Seasick Surfers are all welcome. Yummy beach cocktails will be served alongside Rose Bar's impressive rum selection. $5 Pasta Dinners and $5 Cuba Libre (rum & coke) all night long!!!! had a Saturday night residency. 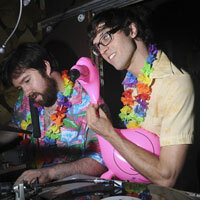 More recently you can find them throwing jams at the Douglass Loft in Gowanus, Brooklyn. Sharegroove will be bringing special selections from their incredibly deep crates to Kiss & Tell along with exclusive edits. - Download their latest mix here. Bethany Benzur is our beautiful resident disco encyclopedia and vinyl purist from Georgia. Ever since she emigrated to the Big Apple in 2007, Bethany has been ruling the dancefloor at Kiss & Tell parties with her Southern charm. The DJ nerds are regularly awed by her selections, and she joins us each month to warm you up with her mix of raunchy electro, glamorous dark disco, and soulful street funk. started Kiss & Tell as an extension of her raunchy knitting circle at Trash Bar in Williamsburg on December 7, 2005. At first only a few people showed up to her new party. However with a lot of help, support, and encouragement from her friends the party has become its own little beast. When she is is not dreaming up crazy themes and guests for Kiss & Tell she is a full time artist and designer. Seze's images and designs have graced dozens of galleries, record covers, posters, flyers, magazines, and web sites. She also co-hosts and photographs the guests of The Bunker, a world renowned weekly techno party in Williamsburg, Brooklyn.